In the early years of the App Store, Apple kept mentioning insane numbers. It was a vanity metric as nobody would install millions of apps. Still, Apple kept sharing new numbers. As of June 2016, there are 2 million iOS apps for the iPhone and iPad. They have been downloaded 130 billion times ever since the App Store was launched in 2008. But many of these apps don’t work at all and are never downloaded. Hundreds of millions of apps were probably built on an older version of iOS and never updated. So it’s time to improve App Store discovery. It’s going to be interesting to see whether the number of apps in the App Store is going to drastically go down. In addition to search ads and extensions in many different apps in iOS 10, Apple plans to remove all these useless apps that clutter the App Store search pages. With this SEO strategy, app developers can trick App Store searches. If you search for “pic collage,” chances are you’re going to find this app. 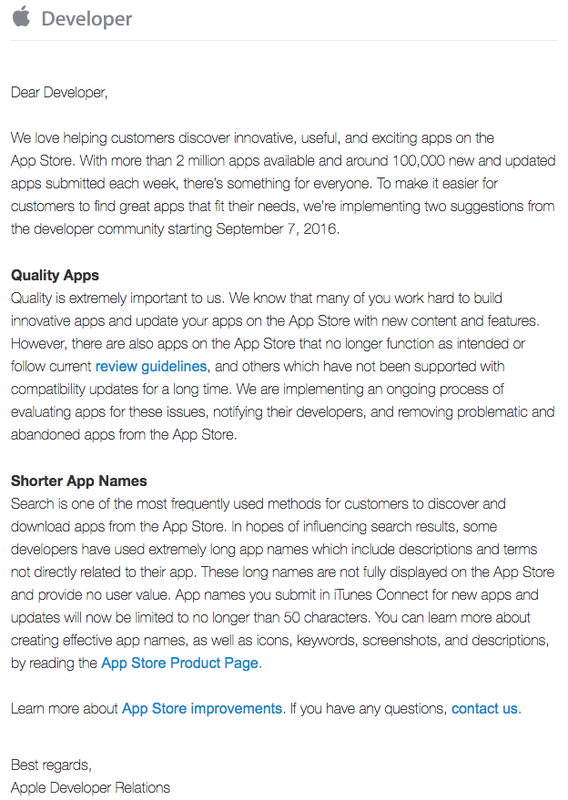 Apple wants clean names to make App Store searches relevant again. From now on, app names have to be shorter than 50 characters. Apple will start reviewing old apps on September 7. Apps that crash on launch will be removed immediately. Other apps will get a notice from Apple first. And if you don’t update over the next 30 days, your app will be removed — you’ll be able to submit your app again though. Apple has released an FAQ to explain the changes.